“I don’t know what it is about those Piper’s Kilt burgers, but they are the best,” Eugene crowed at our last get together. “Better than the Blazer?” Gerry inquired. Eugene’s declaration was pretty much lost on all of us with the exception of Gerry, who obviously knew of the establishments in question. I knew nothing of the Blazer, but was aware of Piper’s Kilt, though not the one Eugene was bragging on, which was in Westchester—and not because of the much heralded burger. The Piper’s Kilt I was familiar with was in the Bronx and I never experienced the burger—or anything else there. 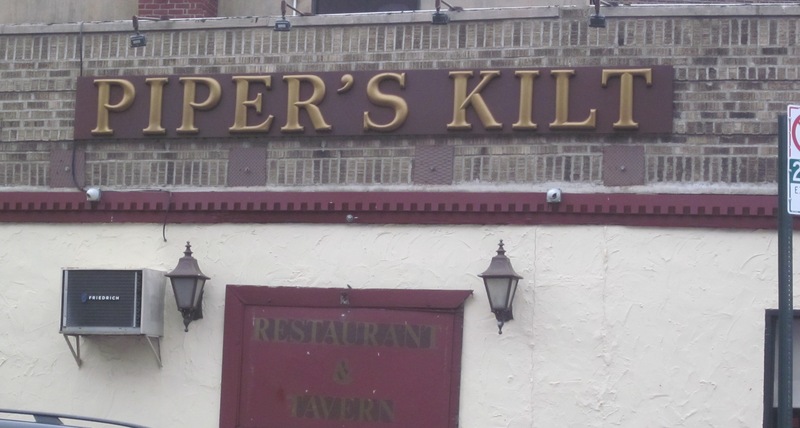 I knew of the Bronx Piper’s Kilt because it was a block away from the Kingsbridge Little League field I had become so familiar with last summer and fall. 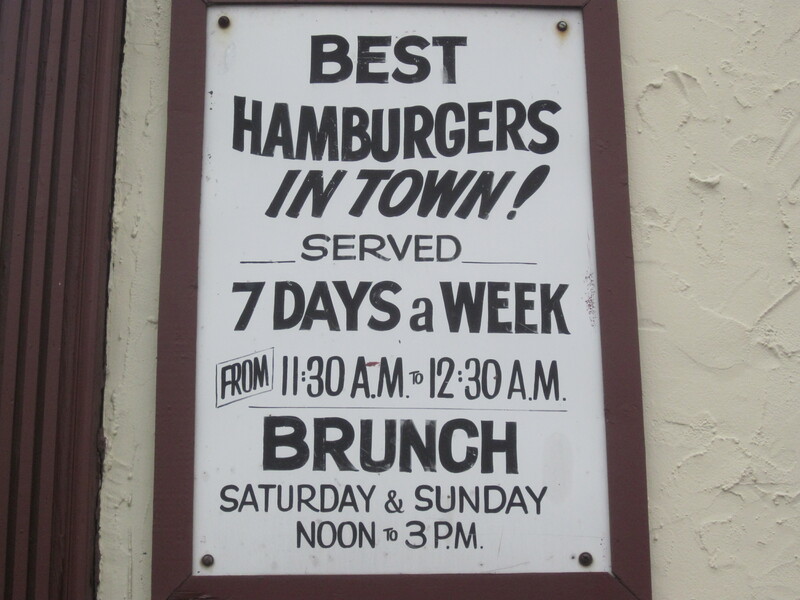 I drove and walked past the place several times during those seasons and took notice of the sign proclaiming the burger being the best in town. Because so many joints make similar assertions, I paid no attention to the claim. I was however, tempted. Piper’s Kilt looked like the perfect place to escape a few innings with a pint of something cold on tap. Despite the temptation, I never went in. For some reason I thought that sitting in a dark tavern, treating myself to a cold one and relishing a Homer Simpson moment while my kids were out on the field playing might send the wrong message to them. But now that it was off season, I could no longer use such a lame excuse and after Eugene’s self assured hamburger pronouncement, I believed it was time to put his Piper’s Kilt claim to test. My eating compadres, Zio and Gerry, tagged along to help me assess. As I often do now when I visit the establishments I wish to chronicle in these pages, I arrived a little early and began taking pictures of the exterior of the restaurant. While I was photographing the sign proclaiming the burger as the best in town, a man in a sport jacket rushed outside and, after telling me he was the owner, asked, a bit defensively, why I was taking the pictures. I mumbled something about how I like to photograph different restaurant signs and send the pictures to my friends. That didn’t seem to satisfy him, so I told him I just like to take pictures of the places I eat and that I heard Piper’s Kilt was good and that I was going to give it a try. “Yeah, you never know,” I said in agreement. After I finished with the pictures, I walked in. Joe was at the bar sitting next to another, much older man who was nursing a white wine. “So are the burgers really that good?” I asked him. “The best in the city,” Joe said definitively. “Is it like the other Piper’s Kilts?” I asked. The Piper’s Kilt Eugene raved about was in Eastchester. And I knew there was one other in the Inwood section of Manhattan. “They do their thing, we do ours,” Joe replied with a sly smile. “The best in the city,” he again said. “It’s the grill,” the man at the bar next to Joe and who I was introduced to as the daytime “mixologist,” added. I didn’t know what to say. 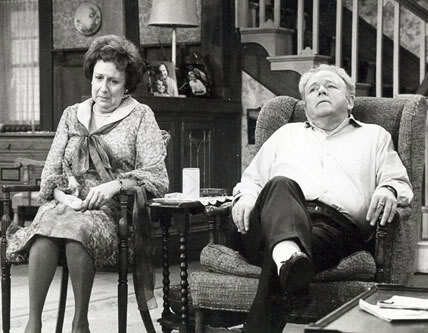 I pictured Archie Bunker’s chair and then tried to remember an “All in the Family” episode where he was farting in his chair. “What I mean is that the grill is so old, it’s really seasoned. That adds to the flavor of the burgers,” Joe explained. Zio walked in and I introduced him to Joe and then Gerry followed. 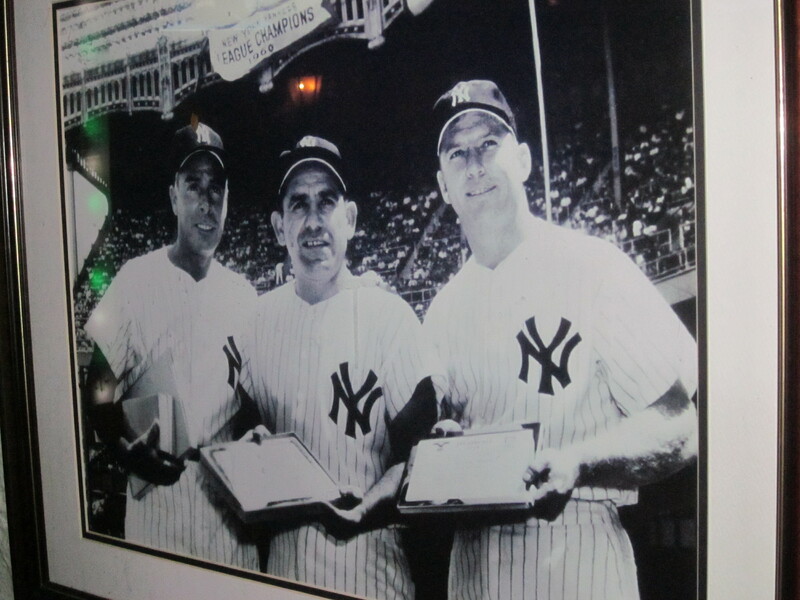 The three of us sat at a high, bar table surrounded by pictures of New York Yankees. 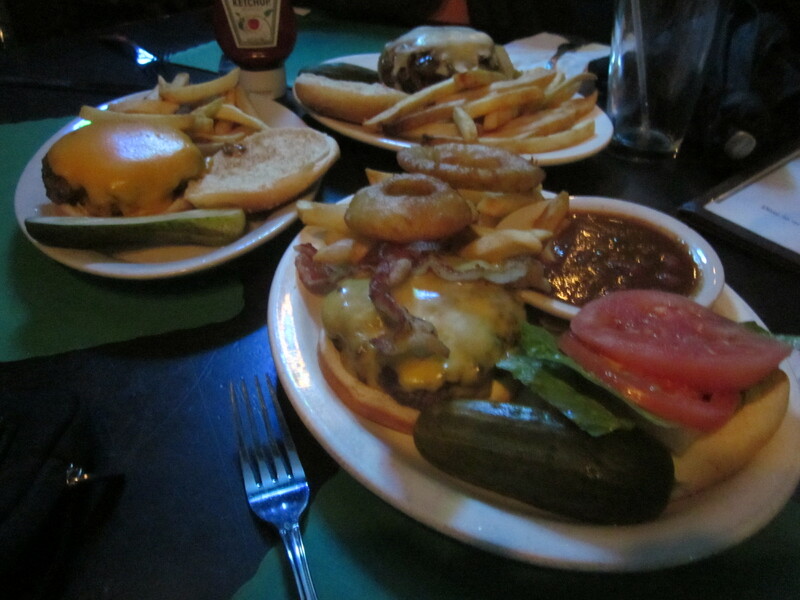 Gerry chose the “Cano,” a burger with Swiss cheese and Canadian bacon. Zio decided on the “Jeter,” bbq sauce and fried onions, while I went with the” #7, the Mickey Mantle:” a burger with cheddar, bacon, and onion rings. While we waited, Joe graciously sent over beers for Gerry and I while Zio stuck to his usual Coke and lime. The burger platters arrived all with French fries, while the #7 included lettuce and tomato along with the chili and onion rings. Clockwise from the top: Cano, Mantle, Jeter. I took a taste of the chili before administering it onto the burger. I didn’t think #7 would have approved. I decided not to harm the burger in any way by the sub par chili. The burger itself, on the other hand, would have made The Mick happy, as it did me. I couldn’t say for sure whether it was the quality of the meat, the way it was cooked to order, or that grill—seasoned most likely by the millions of burgers that had come before mine—that gave it that distinctive burger flavor. And did it really matter what made it so good? Thankfully Joe didn’t put me on the spot and ask me if I concurred with him that the Piper’s Kilt burger was the best in the city. I would have had to told him the truth; that it was not. But I would have told him it was real good and without a doubt, the best burger I’ve ever had in the Bronx, if that is any consolation. Walking out I thought about Joe’s earlier analogy regarding the grill and it was beginning to make more sense to me. The Piper’s Kilt burger evoked the safe and familiar and eating it was probably as much as a comfort to me as Archie Bunker’s chair, which I believe now resides in the Smithsonian Institute, was to him, farts and all. And really, how much more can one ask of a burger than that?